In the second part in a series on Tidy Time Series Analysis, we’ll again use tidyquant to investigate CRAN downloads this time focusing on Rolling Functions. If you haven’t checked out the previous post on period apply functions, you may want to review it to get up to speed. Both zoo and TTR have a number of “roll” and “run” functions, respectively, that are integrated with tidyquant. In this post, we’ll focus on the rollapply function from zoo because of its flexibility with applying custom functions across rolling windows. If you like what you read, please follow us on social media to stay up on the latest Business Science news, events and information! As always, we are interested in both expanding our network of data scientists and seeking new clients interested in applying data science to business and finance. We’ll primarily be using two libraries today. We’ll be using the same “tidyverse” dataset as the last post. The script below gets the package downloads for the first half of 2017. The data is very noisy, meaning it’s difficult to identify trends. We’ll see how rolling functions can help shortly. The most common example of a rolling window calculation is a moving average. 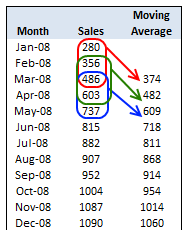 Here’s a nice illustration of a 3-month rolling window calculation from Chandoo.org. A moving average allows us to visualize how an average changes over time, which is very useful in cutting through the noise to detect a trend in a time series dataset. Further, by varying the window (the number of observations included in the rolling calculation), we can vary the sensitivity of the window calculation. This is useful in comparing fast and slow moving averages (shown later). Combining a rolling mean with a rolling standard deviation can help detect regions of abnormal volatility and consolidation. This is the concept behind Bollinger Bands in the financial industry. The bands can be useful in detecting breakouts in trend for many time series, not just financial. We’ll investigate the rollapply function from the zoo package because it allows us to use custom functions that we create! We’ll be using the tq_mutate() function to apply time series functions in a “tidy” way. The tq_mutate() function always adds columns to the existing data frame (rather than returning a new data frame like tq_transmute()). It’s well suited for tasks that result in column-wise dimension changes (not row-wise such as periodicity changes, use tq_transmute for those!). It comes with a bunch of integrated financial and time series package integrations. We can see which apply functions will work by investigating the list of available functions returned by tq_mutate_fun_options(). As we saw in the tidyverse daily download graph above, it can be difficult to understand changes in trends just by visualizing the data. We can use rolling functions to better understand how trends are changing over time. Suppose we’d like to investigate if significant changes in trend are taking place among the package downloads such that future downloads are likely to continue to increase, decrease or stay the same. One way to do this is to use moving averages. Rather than try to sift through the noise, we can use a combination of a fast and slow moving average to detect momentum. tq_mutate args: These select the column to apply the mutation to (“count”) and the mutation function (mutate_fun) to apply (rollapply from zoo). rollapply args: These set the width, align = "right" (aligns with end of data frame), and the FUN we wish to apply (mean in this case). FUN args: These are arguments that get passed to the function. In this case we want to set na.rm = TRUE so NA values are skipped if present. I add an additional tq_mutate arg, col_rename, at the end to rename the column. This is my preference, but it can be placed with the other tq_mutate args above. The output is a little difficult to see. We’ll need to zoom in a little more to detect momentum. Let’s drop the “count” data from the plots and inspect just the moving averages. What we are looking for are points where the fast trend is above (has momentum) or below (is slowing) the slow trend. In addition, we want to inspect for cross-over, which indicates shifts in trend. We can see that several packages have strong upward momentum (purrr and lubridate). Others such as dplyr, knitr and tidyr seem to be cycling in a range. Others such as ggplot2 and stringr have short term downward trends (keep in mind these packages are getting the most downloads of the bunch). The last point is this is only a six month window of data. The long term trends may be much different than short term, but we’ll leave that for another day. The custom function can then be applied in the same way that mean was applied. Now for the fun part: performing the “tidy” rollapply. Let’s apply the custom_stat_fun_2() to groups using tq_mutate() and the rolling function rollapply(). The process is almost identical to the process of applying mean() with the main exception that we need to set by.column = FALSE to prevent a “length of dimnames ” error. The output returned is a “tidy” data frame with each statistic in its own column. We now have the data needed to visualize the rolling average (trend) and the 95% confidence bands (volatility). If you’re familiar with finance, this is actually the concept of the Bollinger Bands. While we’re not trading stocks here, we can see some similarities. We can see periods of consolidation and periods of high variability. Many of the high variability periods are when the package downloads are rapidly increasing. For example, lubridate, purrr and tidyquant all had spikes in downloads causing the 95% Confidence Interval (CI) bands to widen. Connect with @bizScienc on twitter!